Mie Yamie offers Franchise / Waralaba business opportunity (peluang usaha) in Indonesia in Food and Beverages Industry, especially in Mie / Noodles Industry. MieYamie is a food product derived from egg noodles that typically processed without the use of seasonings (MSG) or preservatives. MieYamie has special menus that are processed lawfully and hygienic with quality material and taste. MieYamie Offering an innovative concept in selling their products. Bike Cart MieYamie using a modified and designed in accordance with the latest models that have a uniqueness and charm of its own. 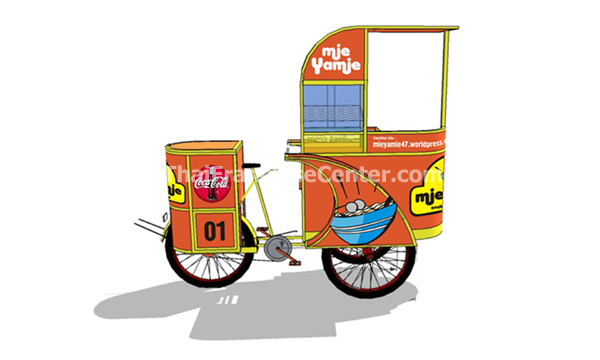 With an innovative concept tries to combine MieYamie one stop shopping by adding a cooler box on the back bike, making it easier for customers to enjoy MieYamie cold drink from the bottle or package after taking MieYamie. Thus it can be obtained by a combination of sales revenue MieYamie with cold drinks from a bottle or packaging. MieYamie can operate throughout the Indonesian archipelago and not closed the possibility of expansion into other countries. MieYamie therefore you need to grow together in raising MieYamie business. MieYamie open opportunity for you all with any background. MieYamie offers food business with a franchise business concepts. Where the first party as the principal owner of the franchise MieYamie (Franchisor) granting rights to the second party (Franchisee) to distribute MieYamie within the scope of geographical area and a specific time period to use the brand, logo, and the operating system owned and developed by the Franchisor. Which later manifested in the form of franchise agreement.